Too few young women are choosing engineering and technology as a career path. A recent Microsoft study of 11,500 girls and young women across Europe found that their interest in STEM subjects dropped dramatically at the age of 15 due to gender stereotypes, peer pressure, lack of female role models and lack of encouragement from parents and teachers. 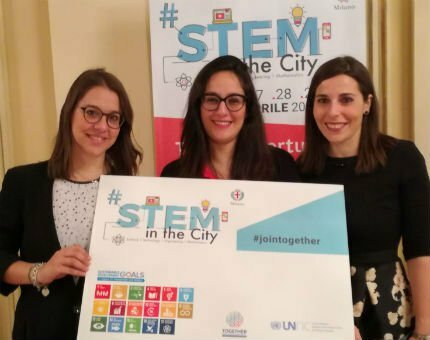 "STEM Month" in Milan, Italy, held its main event on the 28th of April. On “Girls in ICT" (Information and Communications Technology) day, many actions were taken to encourage girls in this growing field. This initiative was promoted by the United Nations International Telecommunications Union (ITU), which aims to change stereotypes and to support young women in STEM courses. For three days, young women were involved in workshops, hackathons and roundtables. 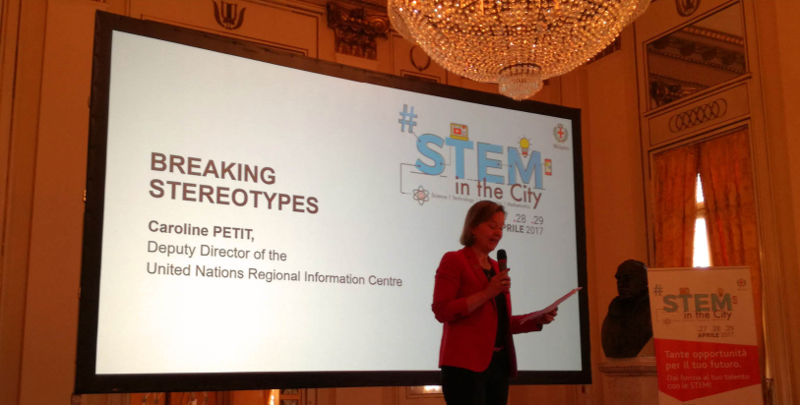 Partners of #STEMintheCity included the Mayor of Milan (Mr. Giuseppe Sala), top universities, schools and the UN ITU. For the fourth year in a row, UNRIC participated in this annual initiative, which is aimed at boosting the value of digital skills for girls and sharing the importance of the Sustainable Development Goals. 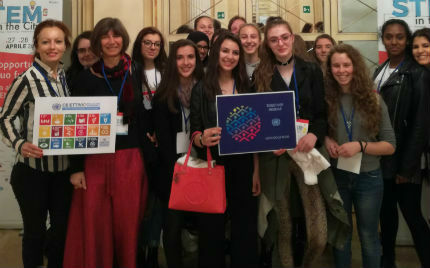 Caroline Petit, Deputy-Director at UNRIC, held a TEDx-style speech on “Women beyond Borders: How to Break Stereotypes”. In her speech, Caroline promoted the importance of “togetherness”, and the inclusion of migrants and refugees in achieving a better world. In line with the TOGETHER campaign, Caroline raised awareness on the importance of diversity in technology and in society as a whole, to an audience of 3,000 young girls. Diversity must be celebrated in all of its forms as it is one of our biggest assets in successfully achieving the SDGs. Diversity as well, is at the center of the TOGETHER campaign, that aims to address stereotypes against refugees and migrants and promote their social integration in host communities. One particular example of the importance of diversity and the inclusion of women is Giuseppina Nicolini, the Mayor of Lampedusa, who recently received the UNESCO Peace Prize for her inclusive work with migrants.